The Schwalm traditional costume has many components that are eye-catching. These components are so striking due to the vibrant colours, and the captivatingly and precisely worked colour embroidery done with silk. 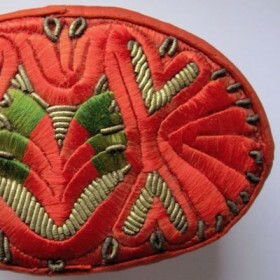 How is it possible that the embroidery, on the bottoms of the caps, on the bands of the caps (Kappenschnüre), on the decorative squares of aprons (Tanzecken), on garters, on the shoulder strap of the men’s gowns, on the breast stomachers (Bruststecker) and others, is so effectively splendid, so precisely worked and appears so embossed? It is because a special paperboard was inserted wherever the fine silk threads are embroidered. There is a veritable treasure trove of different shapes. 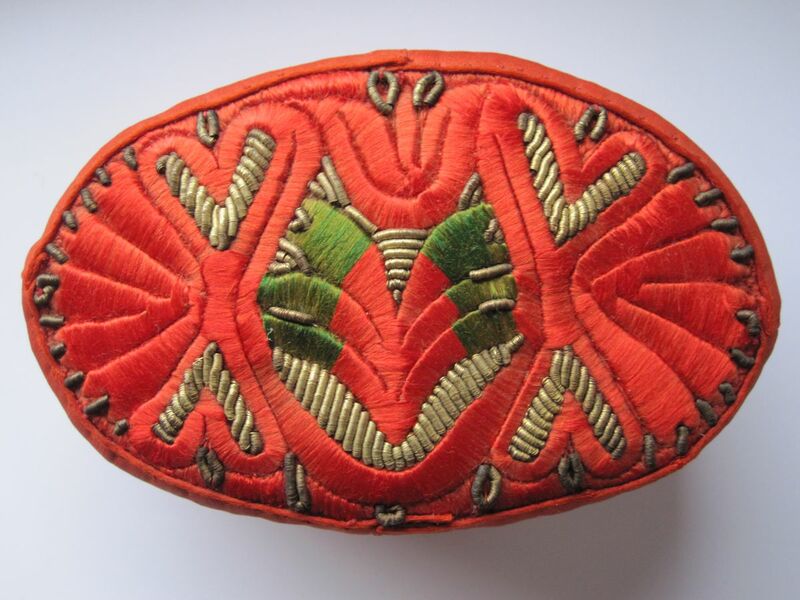 I have to look carefully in my considerable collection of traditional costume accessories to find a paperboard template and a matching embroidered piece. In the end I found two that are very old and a little bit faded and worn; one was worked mainly with green silk and the other with red threads. So that the embroidery can be precisely worked, the first step is to create an absolutely exact template insert. This is the job of a template maker. Ludwig Schmerer from Seigertshausen, a small village in the Schwalm region, is the last surviving craftsman creating these inserts. 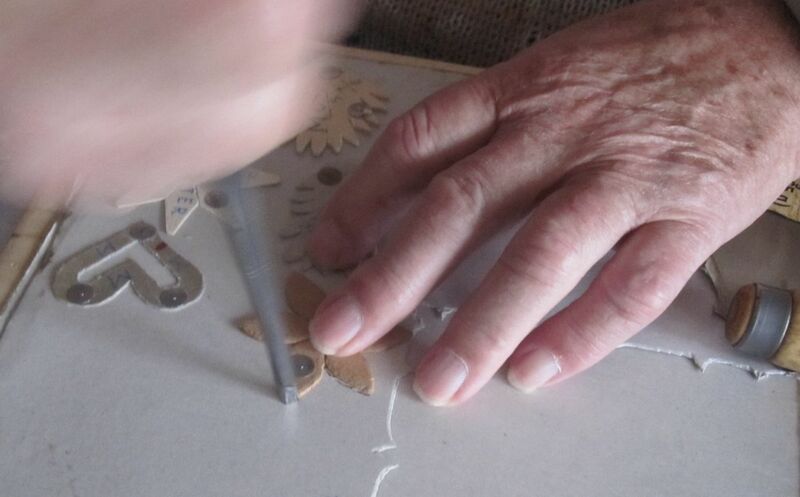 Amiably and comprehensively, he introduced me to the secrets of this old handcraft. First a paperboard is needed. 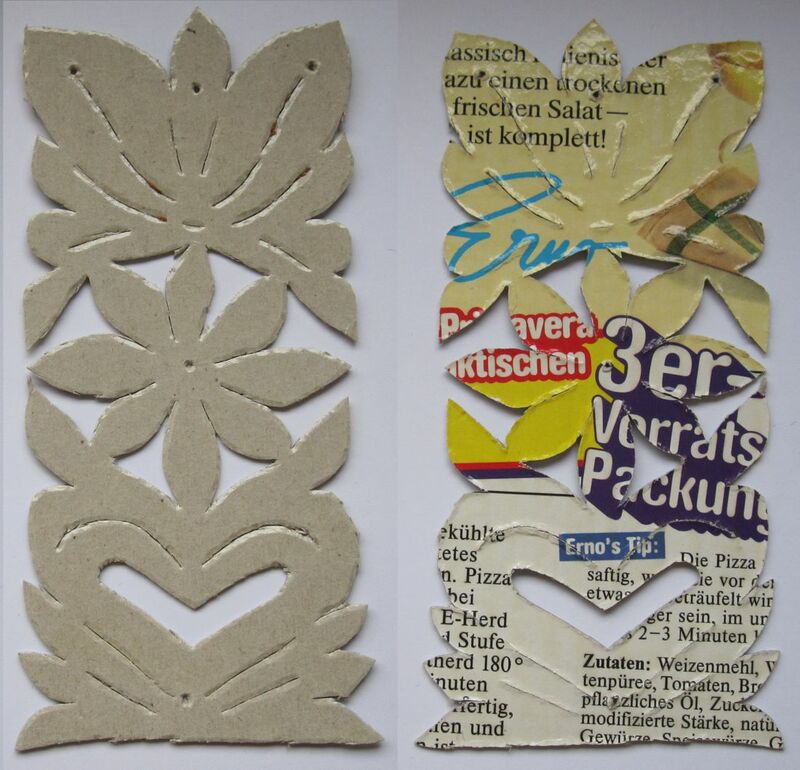 Back in the day, a special paraffined cardboard, known as “Glanzpappe”, was used. This is a very tough paperboard with an especially smooth surface. Ludwig Schmerer uses a trick; he takes thin, smooth paperboard which was the package material maybe of food (Corn Flakes or others). This he brushes generously with watered-down glue. After drying he gets a product which is well suited for making templates. 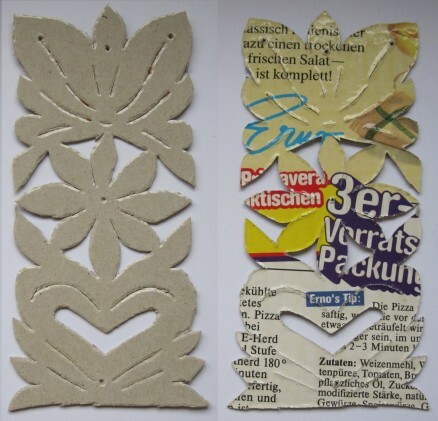 Front- and backside of a paperboard template of Ludwig Schmerer, suitable for making a garter. Also needed is an awl, a sharp pointed tool for punching holes and scoring internal lines of the design on to the paperboard for easy embroidering, and chisels in different widths. A board underneath works as a pad. In former times, basswood (Am.) / limewood (Br.) was used. Hardwoods, such as beech or oak, are unsuitable because the tools would blunt too quickly on the hard material. Conifer wood, like spruce, is also unsuitable because soft and hard parts in the wood do not enable even pricking. So, Mr. Schmerer takes “Limba” (Terminalia superba) because it stands the test of time over many years of cutting templates. Ludwig Schmerer’s pad – a “Limba” board can be seen in the image above. The many and various marks attest to the fact that many templates have been made on this board. On the board is a finished template for a “Bruststecker” (chest stomacher). 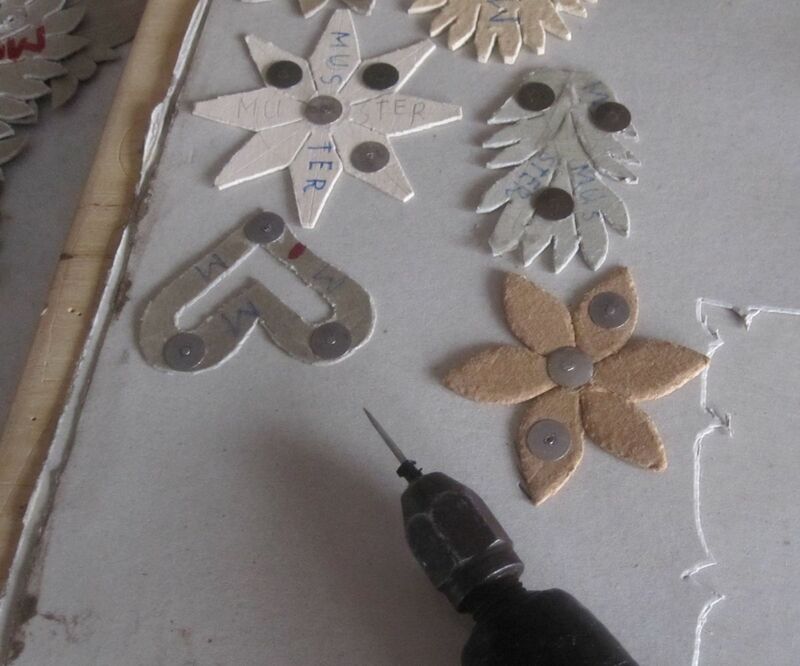 With strong thumbtacks Mr. Schmerer fastens the paperboard and the templates to the pad board. Because he sometimes takes 2 layers of paperboard (please see the pictures above), he uses an awl to pre-prick the holes for the thumbtacks. For models, he takes pattern templates that he himself has made based on historical designs. The same pattern templates are used over, and over again thus making all templates exactly equal. Using a chisel he cuts, using a gently downward pressure, right along the pattern template until the paperboard is severed. The next cut is made next to the previous cut, and so, step by step, the whole pattern template is cut. 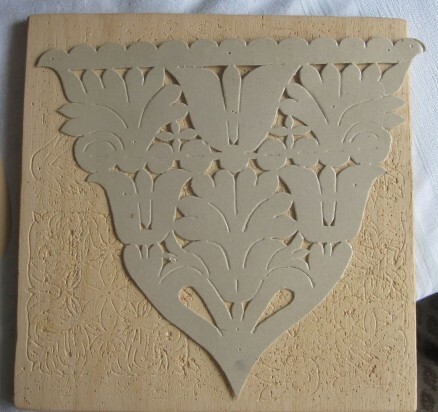 For tips and curves he uses especially small tools, for straight lines he can use a wider chisel edge. Here, in the pictures directly above, he cuts small single templates only. When making larger templates (see the design on the “Limba” board) one must be especially careful to leave enough contact so that the templates cannot fall into single parts. 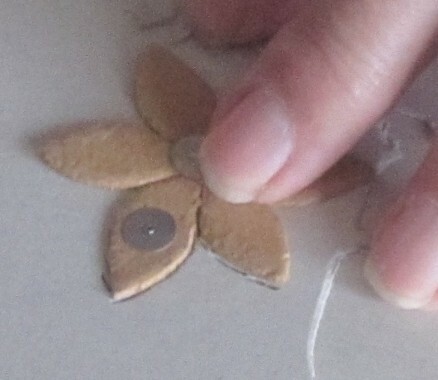 The contact points also need to be narrow enough to allow the embroidering later on. Wonderful post, Luzine. Are these templates for selling? And paperboard templates are still used in embroidery or only in those accessories for traditional customs? You must have such an exquisite collection! I try to get at least one example of each all the traditional accesories. Along the pictures of these pieces it is easier to explain their use. Many of the traditional accecories are hard to find. So the paperboard templates are not for selling. The today use is only for groups of young people wearing the costumes for special celebrations. I used the designs as wonderful inspiration for new whitework designs. I agree with Meri, such a wealth of artifacts and also knowledge! 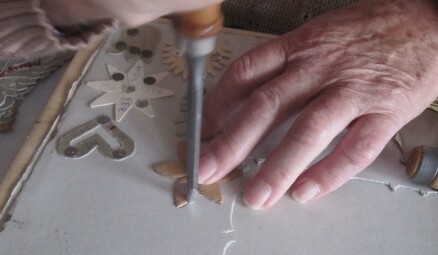 es macht so viel Spaß, an Hand traditioneller Zeugnisse der Schwälmer Trachten immer mehr über deren Entstehung und Verwendung zu erfahren. 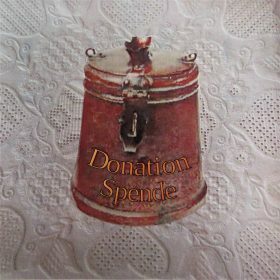 Und es macht auch Spaß, das erworbene Wissen mit anderen zu teilen.